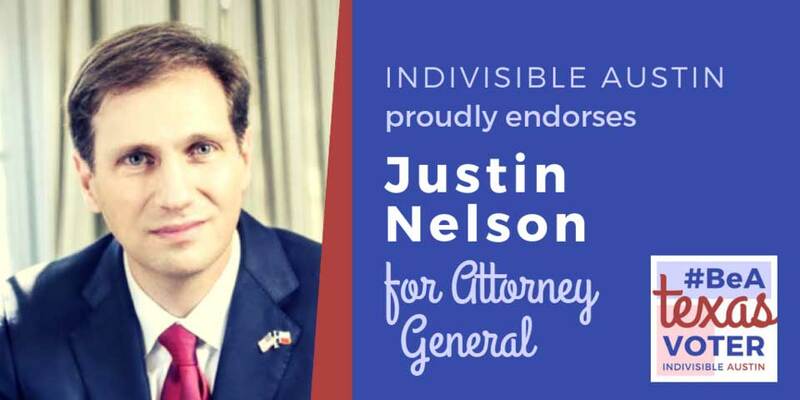 Indivisible Austin is proud to endorse Justin Nelson for Texas Attorney General. Nelson’s campaign has brought serious focus to issues that matter to Texans—and to the serious ethical malpractice committed by the incumbent. In this race, running against indicted Attorney General Ken Paxton, ethics is a serious issue, but not the only one. Want one of our NEW awesome #BeATexasVoter t-shirts? Join us for Pizza, Postcards and Phone banks on Tuesdays and/or weekend blockwalking! Every Tuesday from now until early voting we’re gathering for pizzas, writing postcards to 4,000 Texas voters, and calling Austin-area voters to make sure they get out to vote. Bring your laptop or tablet, phone, and earbuds. We’ll provide everything else you need. The clock is counting down to Nov. 6 and It’s time to talk to voters! Charge up your Fitbit and join our team for weekly get-out-the-vote blockwalking. We’re not only working to turn out voters for Beto and other candidates endorsed by national and local Indivisible groups—we’re also building long-term progressive infrastructure and community in Texas. 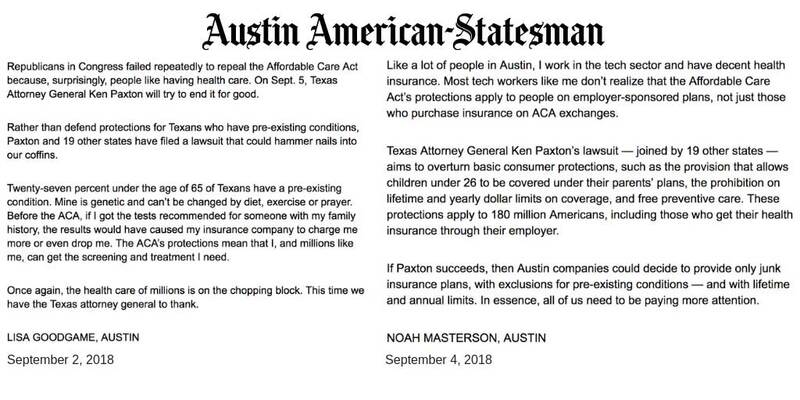 On Wednesday, September 5, Texas and 19 other states are going to federal court in an effort to end health care protections for millions of people, including the 130 million Americans with pre-existing conditions (cancer, diabetes, heart disease, genetic conditions, depression, and even pregnancy). Indicted attorney general Ken Paxton is the ringleader. The court case may or may not succeed. We don’t know. But this will not be the last effort to deprive Americans of health care. We fought for eight months to save the ACA. Let’s not relax for one second, as the GOP already has plans to continue their war on Obamacare in the next legislative session. Keep calling your reps, writing letters to the editor, and make a plan to vote this November. Lives are on the line. “Birtherism is now federal policy,” tweeted columnist Max Boot, as news spread that a growing number of Latino citizens in Texas were having their citizenship questioned and being denied passports. Call your reps—senators and House representatives—and demand answers. This questioning of citizenship, of who the “real” Americans are, invokes some of the darkest periods of history. I am calling to ask you to investigate the Washington Post report of U.S. citizens—including military personnel and border agents—being denied passport renewals and having their citizenship questioned. We need immediate clarification on why this is happening and how the government plans to resolve the citizenship question for those caught up in this Catch-22. We also need clarification on why the State Department asserts that nothing has changed. Will you condemn this latest move and do everything in your power to resolve the situation, and quickly? A federal judge shot down a lawsuit to try to block DACA. What is your pet’s top issue this election season? Is it a good day for some #adorables? [ ] I am dead my heart is too small and cold to beat. Every week, every day, we’re working with our volunteers to make sure that in November we win a victory for American values and decency. 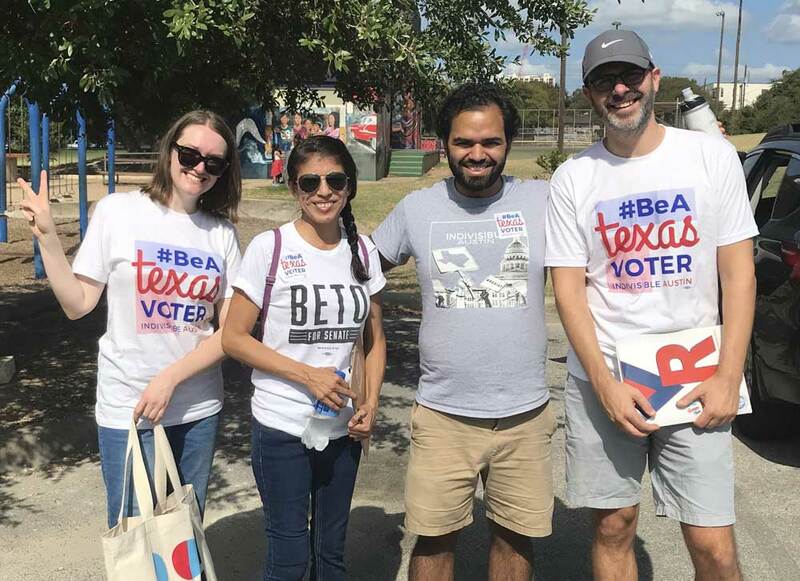 Registering voters, phone calls, canvassing, postcards, all of it will combine with the work of thousands of other volunteers across Texas and all across America to achieve the victory we need. But as the campaign season goes on, our budget is tightening, and every day, we are looking at the numbers making hard choices about what we can and can’t afford to do. Help us make sure that we don’t come up short, that we don’t leave work undone. Support Indivisible Austin’s midterm efforts today.